Savings bonds can increase in value over time. 3. Can I Still Purchase Savings Bonds Using My Credit Card? Buying your grandchild a U.S. saving bond is considered a safe investment because it is guaranteed by the government of the United States. Savings bonds also are advantageous because you don't have to pay local and state taxes on any interest earned. 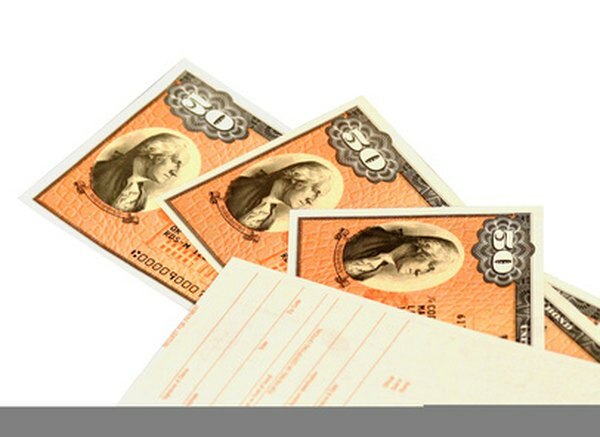 Before Jan. 1, 2012, it was possible to purchase savings bonds online or at your local commercial bank. However, bonds are now available only through the TreasuryDirect website. As of 2012, Series I and Series EE bonds are the two types that are available for purchase. Go to the TreasuryDirect website and open an account (aee Resources for a link). Your email address, tax ID number and bank account and routing numbers are some of the information you need to open the account. TreasuryDirect sends you emails with your account number and one-time passcode after you open the account. Log in to your new TreasuryDirect account using your account number, one-time passcode and your password. Click the "BuyDirect" tab near the top of your account page. You need your grandchild's Social Security number and full legal name to complete the purchase. Click the radio button next to the type of savings bond you want to buy, such as "Series EE." Click the "Submit" button at the bottom of the page to continue. Click the "Add New Registration" button, and then select the "Sole Owner" radio button on the next page. Enter your grandchild's full name and Social Security number in the appropriate fields, and then click the "This is a Gift" check box. Click the "Submit" button to proceed to the next page. Click the drop-down box next to "Add New Registration" and select your grandchild's name from the list. Enter the dollar amount of the bond in the "Purchase Amount" box, select the bank account you want to use to pay for the bond, and then click "Submit." Select the "Schedule Single Purchase For" radio button and click the "Submit" button. The Purchase Review page appears, displaying the information regarding your purchase request. Review the information to ensure it is accurate, and then click the "Submit" button. The Confirmation page appears, displaying the confirmation number of your purchase. The gift bond appears on your account page after one business day. Contact your grandchild and have her open a TreasuryDirect account to receive the bond if she is over 18. If she is a minor, you can leave the gift bond in your account until she is 18 or ask her parents to open a minor account for her. When you have your grandchild's TreasuryDirect account number, click the "Gift Box" tab at the top of your account page. Select the radio button next to the gift bond and click "Submit." Click the "Deliver" button and enter your grandchild's TreasuryDirect account number and click "Submit." After the delivery is completed, your grandchild will receive an email from TreasuryDirect confirming the gift bond is in her account.